Well there was Bill Barrett who rode under that name for Oxford and Arena in the 80s then turned up a couple of years back on ice speedway as Andrew Barrett!! Watched a couple of heats from the Holsted v Slangerup meeting and Nicki was miles in front of Zmarzlik, who was even beaten by Bach if I saw that correct!!! Have to agree with Steve in that it would be easier to name the not so friendly riders. But we don’t want to start any negativity and quite frankly I can’t think of any The one who sticks in my mind and I have mentioned it a couple of times was Bob Paulson, who was both friendly and mental in a crazy way. Out of the blue whilst waiting in the pits with a friend started calling me the wizard. I wasn’t quite sure what was going on, but he signed my book to ‘the wizard’ and I still have that somewhere around !! These line-ups really are underwhelming !!! Have the tables turned now ? Years ago the Polish clubs had the upper hand and could dictate to the riders. The only one I know who was having none of it was Hauzinger, who would race in the Danish 1 division instead of turning up for practice. He told me they wouldn't stop him earning money on a Saturday, although quite what he could earn on a Saturday in Denmark couldn't have been too much !! But he was hardly a start anywhere apart from in Austria Now it seems there is a complete lack of riders available for all the clubs. They are signing up foreign riders of fairly average quality and so a decent rider knows he has an advantage and will be valuable on the market. Some like Cook(at home) and maybe now Bewley are trying to take advantage? His average was lower than both though. Or are you saying just at Arlington he was better or more exciting or something? 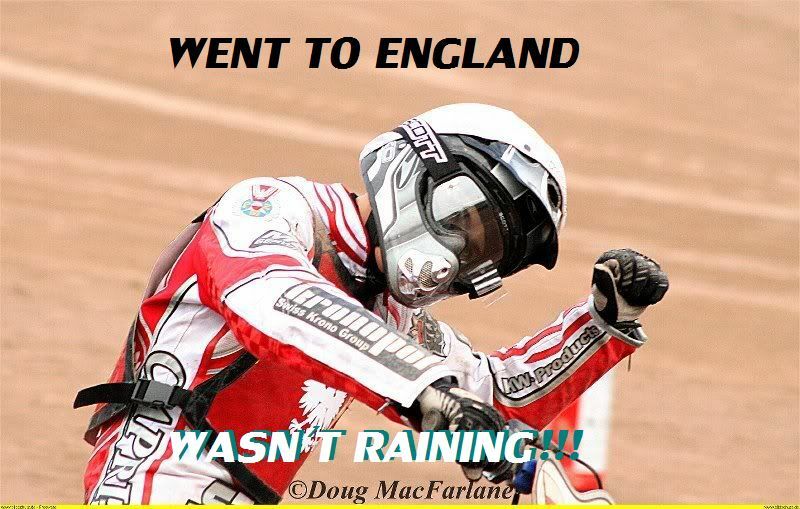 Not only that, but he finished 8th in the world final. If he finished 8th in a GP series he would automatically be in the next season. All this talk of Jack Young is bunkum!! !